The kit has everyting you need to remove the 8 mm glow plugs: 8 mm socket, extention shaft and flex joint. Make sure your compressor delivers the required 250 liters per minute. I bought the famous Kroil penetrating oil and applied it twice on the top of the glow plug threads and let it sit there for 48 hours. 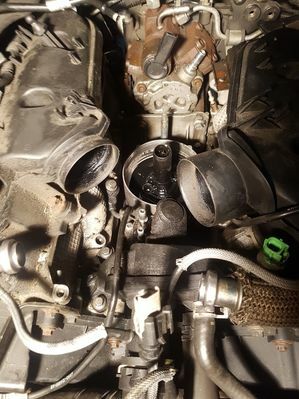 To get the infamous oil separator out you have to remove the air intake and exhaust recirculation housing, oil filter, fuel lines that have a quick disconnect coupling, and the glow plug power supply rails. Also remove both electrical connectors on the HPFP and various other cables/connectors that are in the way. The coolant pipe on the back of the engine that goes across the engine needs to go as well. Undo 1 bolt on the rear bracket and unclip it on the rhs and move it over to the left. You need a hose clamp removal tool to remove the rear hose of the oil separator. Then lift the oil separator up vertically and off the guiding pin. Pull it back over the oil filter housing then turn the oil separator downwards with its big round cap moving towards the engine so that both tubes from the oil separator are sort of horizontal and pointing towards you. 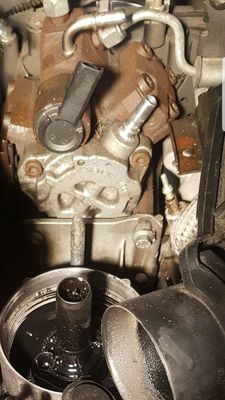 Lastly lift both tubes up and force the right tube over the edge of the rhs air intake manifold, by using a lever or by compressing both tubes a little, if required. Now that the monster is removed you have all the space required to remove the glow plugs.....almost as the HPFP is in the way for the last glow plug on the rhs. You can see the glow plug on the image. In stead of removing the rear belt and the HPFP I used a Dremel tool and removed a bit of the metal surrounding the upper rh HPFP bolt. After that it becomes easy to remove that glow plug as well. The vibro impact tool did the trick, together with the penetrating oil. 4 plugs spun out really easy on the initial torque setting of 10 Nm. 2 plugs needed 20 Nm. Used copper grease on the threads of the new ones before installing them. Remember to take photos of the top of the engine, electric wiring and fuel lines before removal. Comes handy when putting everything back again. I have just bought exactly the same kit and kroil..... My logic is I might as well see how many I can do before handing it over to someone to drill out etc.Additionally I thought I would bath the glow plugs in 50% atf/acetone for a longer period before starting work though. Say over a few weeks. I just wish I had been organised enough to do this in August when it was 30+degrees! Would you be able to share more/ higher resolution photos showing the metal you removed around the hpfp bolt? On the image you clearly see the fuel pump obstructing the glow plug in question. You only need to remove a few milimeters to allow removal and replacement of the glow plug. Did you get them all out, this did not work with mine and I ended up getting them drilled out. They all came out quite easily. However I did apply the penetrating oil before as I wrote and gave it 2 applications and 2 days to do its work. The instructions that come with the vibro-impact tool say to start with 10 Nm and work your way up to 30 Nm if you have to but not recommended to use 40 Nm. When 2 plugs did not move on 10 Nm and initially neither with 20 Nm I used the vibro-impact tool in the FASTEN direction for a short blast. When I then reversed direction they spun out first very slowly but came out nicely. I saw very little corrosion on the glow plugs, maybe only a little on the 3rd-5th thread. Could be because of the dry air we have in Norway. I was stressed too that one or more plugs would snap, that is why I bought the full extraction kit as well. A trick that might help when a plug is stuck is to first heat-up its surroundings with a heat gun. Then apply Freeze spray through a tube placed over the plug to only freeze the plug. Did you give up before breaking them? Tonight after work I went to the late night self-service garage in Winterthur near Zurich and bathed my glow plugs in about 200mm of 50/50 Power Steering Fluid and Acetone. I'll drive the car around for a few weeks and tackle the glow plugs in about a month using the vibro impact tool I'll pick up in the UK over Christmas. I'm pretty convinced my clutch is on its last legs so that's the next job so hopefully this will have time to penetrate. Large DHL delivery from AF arrives tomorrow! Before I leave for the airport, hopefully! To get to the point where I could see enough of the glow plugs to get this concoction onto the threads, apply it generously and reassemble took 90 minutes. Necessary steps were removing the intake air shutoff throttle and taking out the oil filter (careful when you put that back in - remove the cartridge from the plastic body first by levering it carefully with a screwdriver). I got a spec of it on the top of the grill that is covered by the bonnet and it took the paint off immediately! Strong stuff. I did this in a massive garage with the external doors open -you will value some ventilation if you do this. To apply the mixture I used a giant pipette with a long stem that I could get to the threads, or near enough I could be confident it would seep in. The EGR pipe clamps were initially problematic ( I gave up on Saturday) but I found a pair of tile nippers to be a suitable tool and no damage occurred to the clamps. Will update when I need make some progress worth reporting. I do plan to add injection cleaner to the full tank of fuel I have and will look into a seafoam or equivalent product also. If you are interested in what 90 minutes in a Swiss self service garage cost the answer is £20. Worth it for the lighting alone! Just pulled mine. It's a 6 to 8 hours job. If you don't rush it it works well. Thanks for the nice description and the pictures. I got them all out but had an angular drill and a puller on stand by. Soaking them in oil and having a hot engine really helps, Starts like new. Happy I did it, finally. I took this job on today with the essentially same kit as OP. It is not easy. Changing the clutch was more easy! [Actual lol] But I broke no plugs! I fully changed 3 (disappointing tbh but I had a time constraint) I will return for the other 3 after my trip to the mountains in a week. 2 are 50-75% out and the 3rd is 10% out. Rails still connect. Soak with kroil - check. I soaked with kroil last night. I had previously soaked all the plugs with 50/50 PSF/acetone once before Christmas and again a week ago. My feeling is this may have softened some of the coke buildup and made the rest of this job possible but note my point about flushing below. Getting advance access to the plugs with a large pipette (From an error ebay order but actually quite useful!) is a 20 minute task. So you are all done within an hour. Also I put seafoam in the tank and burned through half a tank before beginning. No major bulbs of carbon were on the glowplugs which I removed. When I do all 6 I will post a photo. So for the main job: I started with 10NM, and got nowhere. Straight up to 20 and got movement in a couple of the plugs. 3 hours in I had developed the right technique which was go to go raj on it. 40 NM back, 30 NM forward and repeat. Get some positive movement, take a moment to evaluate your life decisions and ponder if you broke plug! Flush out the coke/oil mix with fresh kroil and move on to the next glow plug. I worked in a circular motion around the plugs. 1a. Low torque impact tool was essential. I have the laser tool version and using the universal joint I could work on the plug by the HPFP without conflict. Note the universal joint reduced effectiveness of the tool by say 50% but it does still work and I did get movement. I took the decision to de-prioritise the HPFP because the the time overhead of setup on this plug was higher that the others I could work on with simple extension. One of the floating mechanics at my self-service garage evaluated if he could free the 4th plug which I had 75% out and after applying a little pressure quickly stopped! Well done mechanic! I had told him to take no chances. 1b The 8 mm bit with the laser tool does not have enough cut out inside for the pre-8mm part of the glow plug. It gets on the plug only fractionally. For a couple of plugs I got them off enough before this part rounded that I could switch to another deeper inside socket. My next workaround was to place an 8mm nut on the head of each glow plug to space out the deeper socket so the vibration was acting only on the glow plug. I will probably drill out the inside of the laser 8mm bit before returning for the other 3. 2. The fat bits of the glow plug rails that say left and right go towards the front of the engine! That should save you 30 minutes of faff! 3. Removing the oil separator is like one of those rubbish logic puzzles you might get for Christmas. Mainly because I didn't look it up on this forum before starting (and using only the workshop manual) I lost a good 90 minutes on getting this out and back in. Research this step thoroughly before beginning! 4. This is a b d of a job but take the right steps and it is doable. 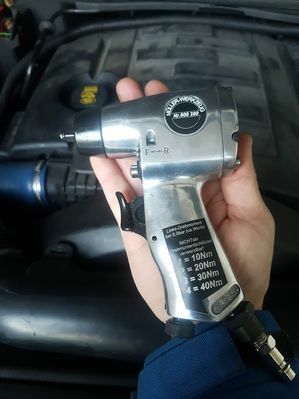 Allow for 10 hours in the workshop with access to an airline (FYI I had to swap the connector on mine to work at this self-service garage so consider this). Believe it of not you will find there is a "sweet spot" or angle and pressure to get any given plug out with the impact tool. Seek out this sweet spot! 5 Be very very very careful when you have the oil filter housing removed. I used rags and it did work but maybe there is a better solution (a rubber glove stretched over might be good). My main predicament was that the 13 year old loom cable sheath disintegrates into a million pieces and splinters everywhere when you move a cable. You do not what that in your engine!!! Related is I broke one of the clips for some piping which I should know what it is but don't and had to bodge a piece of rubber/zip tie solution. A heat gun on these clips might make your life easier. I now need to trawl the AF site for one of these clips! Also related - take care when using the impact tool with an extension that you aren't burning through cables/ vacuum lines? I caught myself doing this early and learned that lesson while I had time. 6. When the plug is unscrewed all the way it probably still wont come out. Liberally apply more kroil everywhere and switch to a manual ratchet and work up one side so the plug gets lifted. They look so sad when they come out this will give you the necessary lift to keep going! 7. I sought to begin work on a baking hot engine. Disco Mikey says to start with a cold engine as its easier and I know which one of the two of us I would trust more! 8. Get to self-service garage at 8.50. Damnit should have taken it there last night and it would have been lovely and cold! 9. Did my garage have a compressor with the necessary flow rate/ was my laser tool NM reference accurate? i.e. given OP comments, why did I have go raj on my glow plugs to get them out? Maybe effectively I didn't. 10.You will be forever mentally scarred by the sight of the text "8mm" rotating at 100th of the pace of an actual snail.